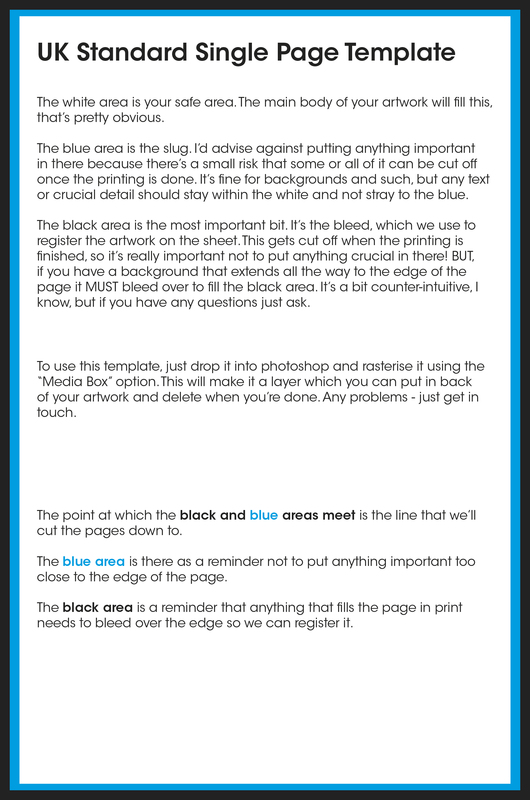 Saddle Stitched Comic templates, plus bonus poster, postcard, and business card templates. Most of these have instructions for use on them, but in some cases those haven’t made it onto the template for one reason or another (one reason is that there’s not enough space, another is that I didn’t always copy and paste the text from one template to another when I made them…) There are full instructions at the bottom of the page under the General Instructions bit. If you want to use the PDF versions of the these just click the name and they’ll start downloading. If you’ve a preference for JPGs clicking the name will take you through to a new page with the template on it – simply right click and save to pull it down. 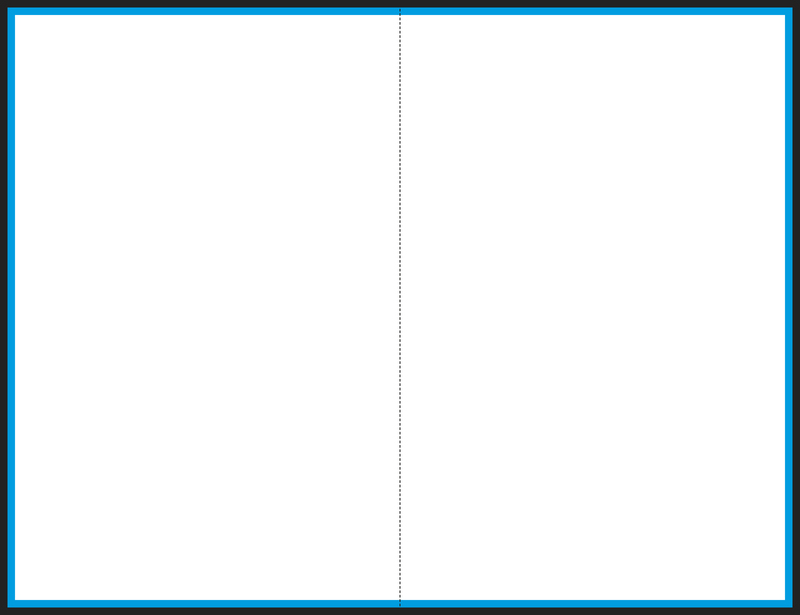 OK, so I can’t give you templates for the various covers that pair to these, because the spine width depends on the number of pages, and I’m not making templates for every option because I’m not some kind of printing Sisyphus. I can, however, give you some text templates that are a good starting point. 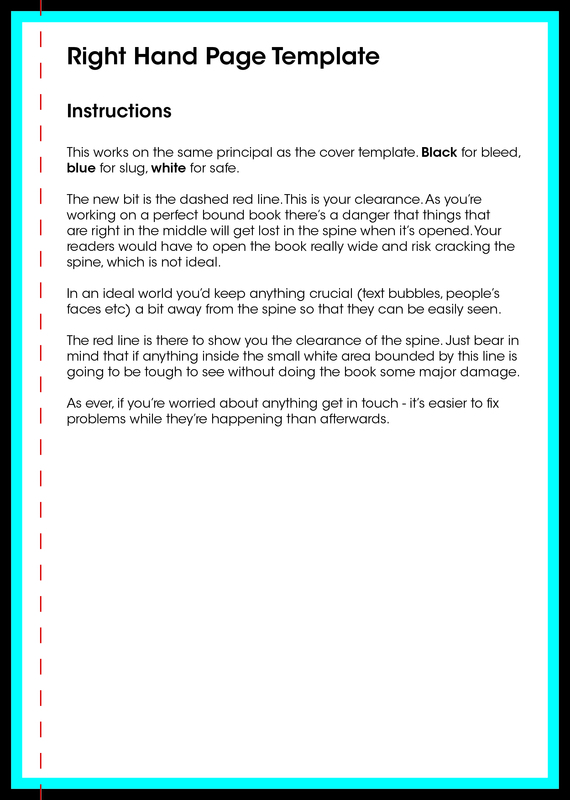 These are a lot like the saddle stitch templates above, but they have a red dotted line on them that indicates the suggested clearance from the spine. It doesn’t matter hugely if you stray into this area, but it’ll be tough to read comfortably, so my general suggestion is to avoid putting anything too important in there. 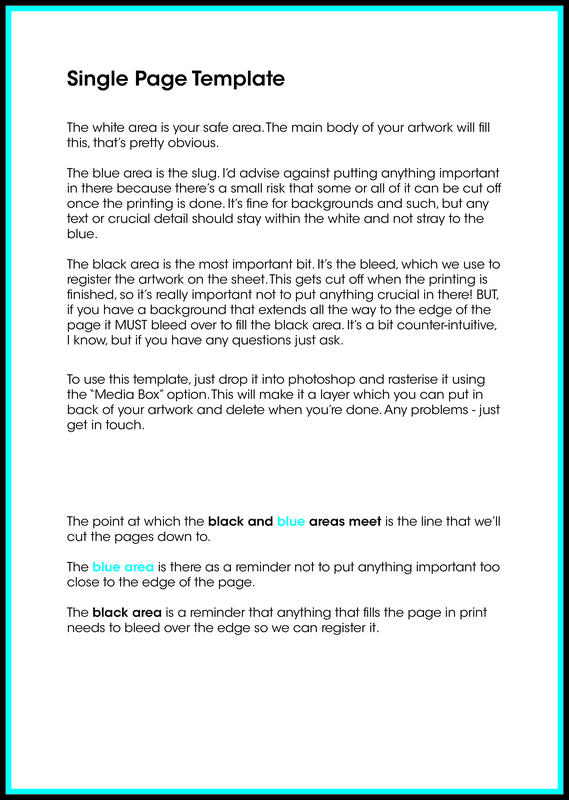 Text and important artwork details. That kind of thing. The bleed, trim, and safe sizes are all the same as on the stitch templates, so you don’t need me to repeat those, right? 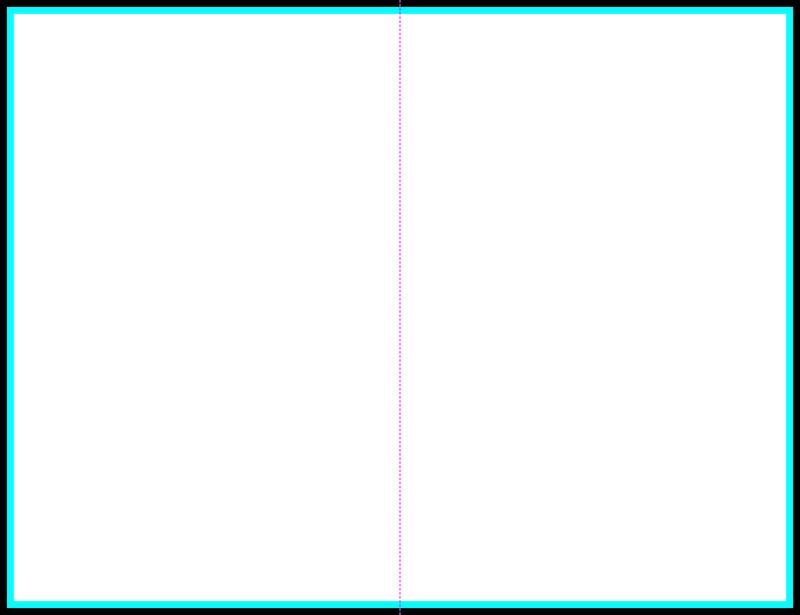 You’ll see that a lot of these reference the corresponding cover template, which you don’t have, because it isn’t here. 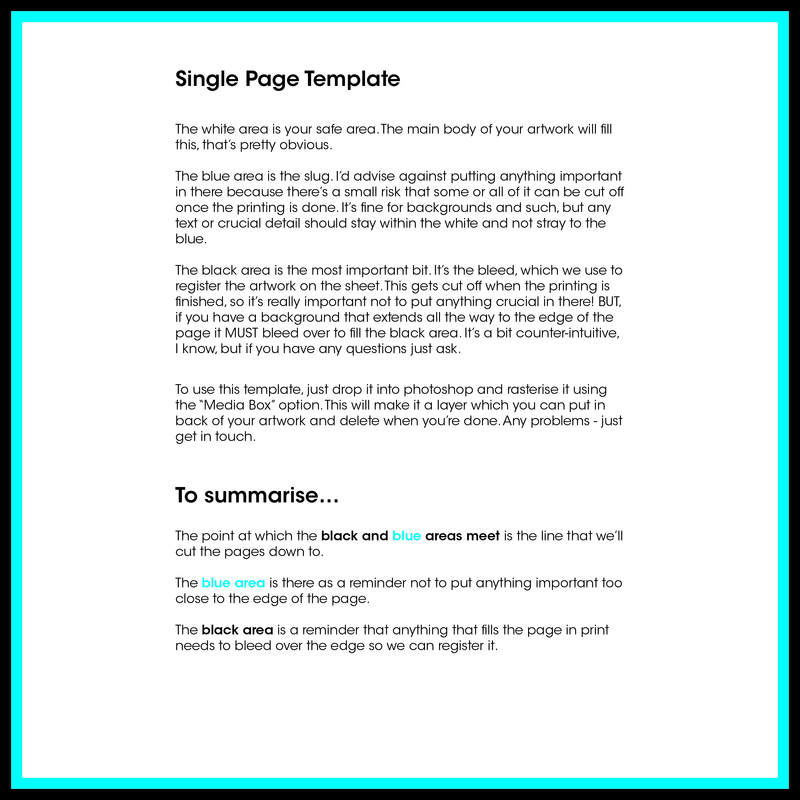 To get hold of the appropriate cover template drop an email here letting us know the size you’re going for and the page count. 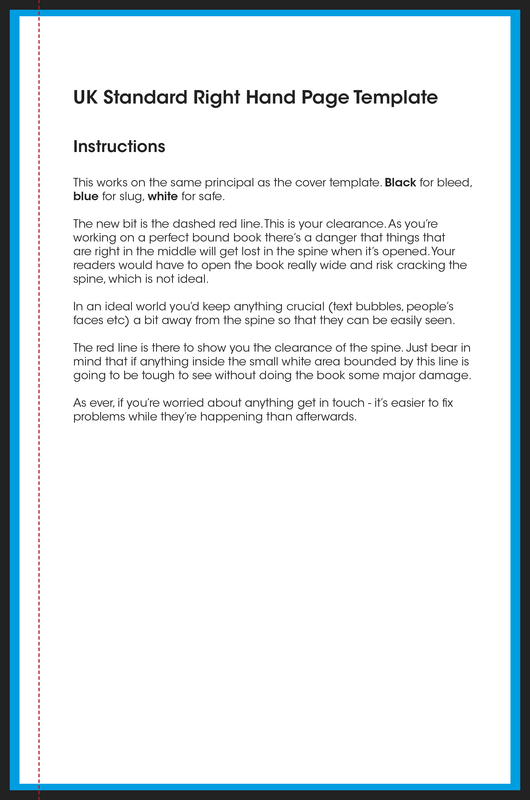 We’ll make one up special for you with the right spine width and everything. 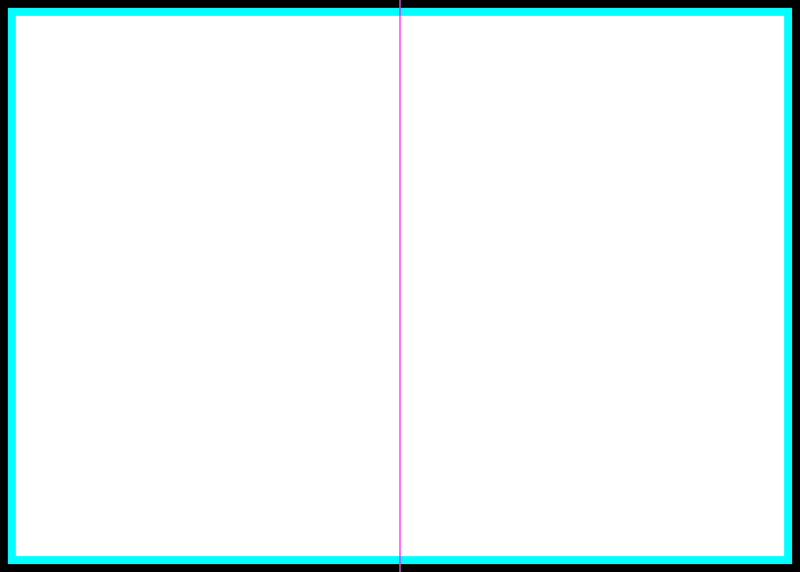 If you’re using the JPG versions of these you’ll only have the right hand pages. 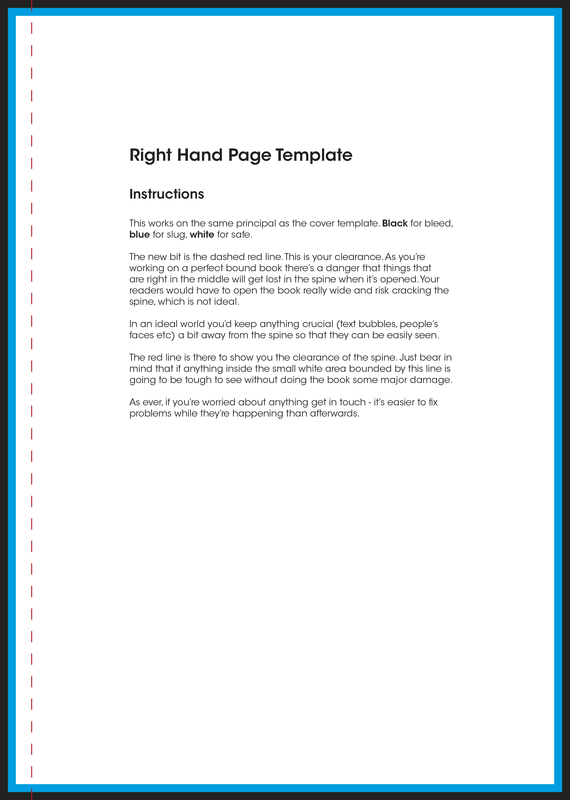 For the left hand pages just flip along the vertical axis or rotate by 180°. How do you use these bad boys, then? Well, it’s quite simple. They’re ideally designed for use in Photoshop (although you can use them in Indesign and Illustrator as well if you like – just remember to set up the document to trim size and set the bleeds as 3mm on each side). All you need to do is drop them into your chosen software as a background layer and you’re good to go. 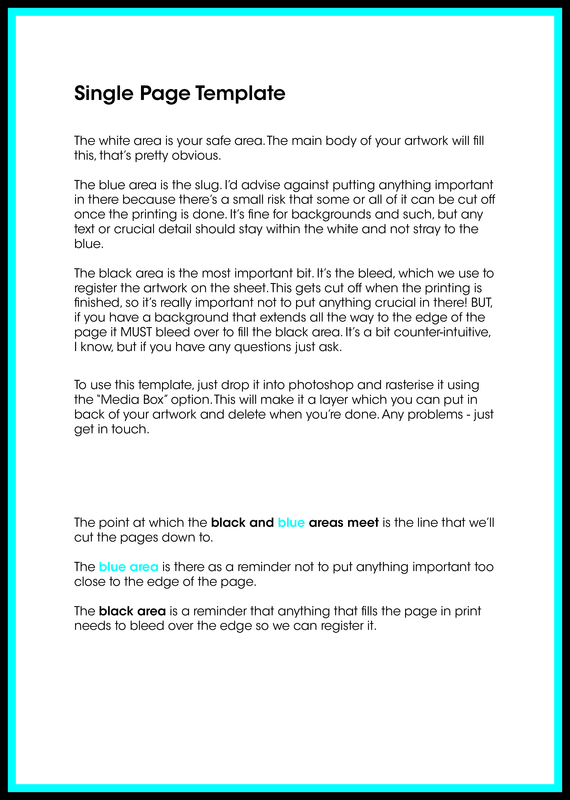 If something touches the inside area of the black area it MUST extend all the way over to the outside edge of it as well. Clear? Because if you get your bleeds right (there’s a more detailed discussion of bleeds over here) you’ll be saving us, and therefore you, so much time. It’ll be ace. The point at which the black and blue areas touch is the trim line. This is where we cut to when the printing’s been done – everything outside that line is not going to appear in print (we still need the bleed, though, not just a block of solid colour, because this is how we register the pages on the press). When we’re trimming we’re very careful, but it’s not something that can be done with 100% precision every time – part of the reason we need the bleed to be an extension of the artwork is so that when trimming minor imprecision doesn’t matter so much. The industry tolerance for trimming is within 3mm, hence the need for bleeds. In practice we get 99.9% of the trimming spot on, and make sure that foul copies either don’t reach you or are replaced *at speed*, but this is your insurance. Of course, that 3mm tolerance goes both ways, which is why we suggest paying heed to your safe area. Try and keep anything important (faces, speech bubbles, that kind of thing) within the safe area if you can – that way it definitely won’t be trimmed off. Also, it’ll look more balanced in general. Constant improvement through the provision of updates is our jam. 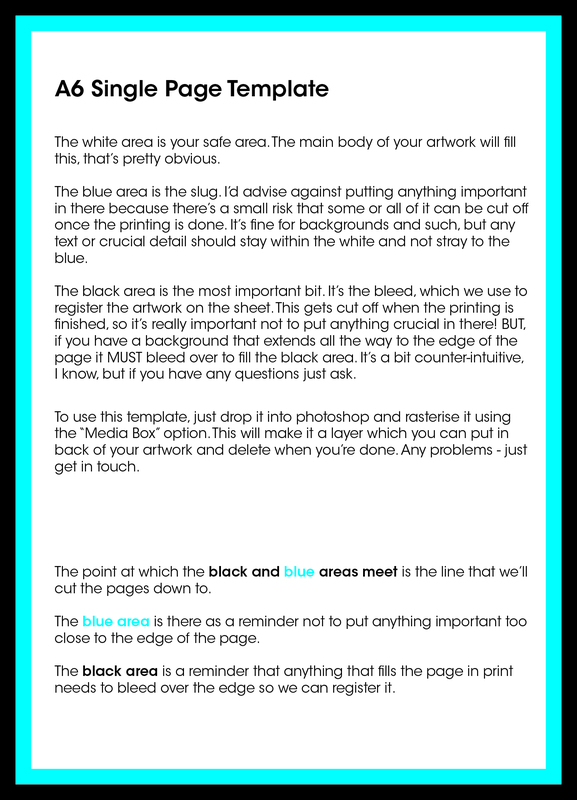 We’ll add more templates in due course; if there’s any particular template you’d like to see added here as a priority, drop us an email.